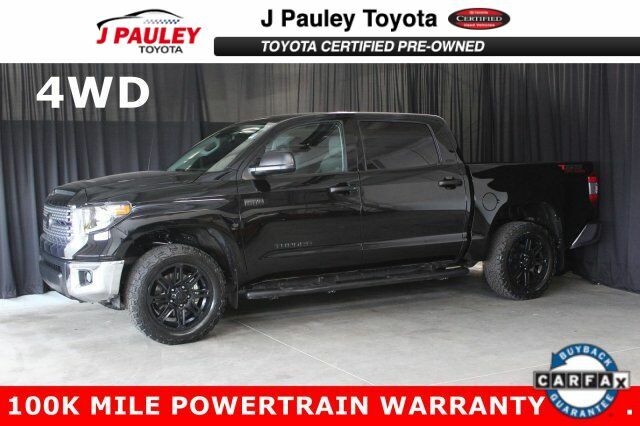 This certified 2018 Toyota Tundra 4WD SR5 has a CARFAX free of accidents and damage. It comes equipped with these options: exterior side steps, tow hitch, premium alloy wheels, all terrain tires, 4 wheel drive, power locks, power windows, power adjusting driver's seat, AM/FM radio, CD player, AUX input, USB port, multiple power sources, GPS navigation, backup camera, cruise control, lane departure warning, Bluetooth, and keyless entry. Stop by and visit us at J. Pauley Toyota-Scion, 6200 S 36Th St, Fort Smith, AR 72908. Toyota Certified Pre-Owned: 160 point quality assurance inspection. Up to 7 years or 100,000 mile Powertrain Warranty. 12 months or 12,000 miles Comprehensive Warranty. We hand select premium used vehicles to ensure the very best value. The Best New Cars Make The Best Used Cars! Schedule your test drive today. Call and ask for Adam Nobles for Special Internet Discount Pricing!